Make a hand forged knife, small axe, herb knife, fire poker or choose an item of your choice. 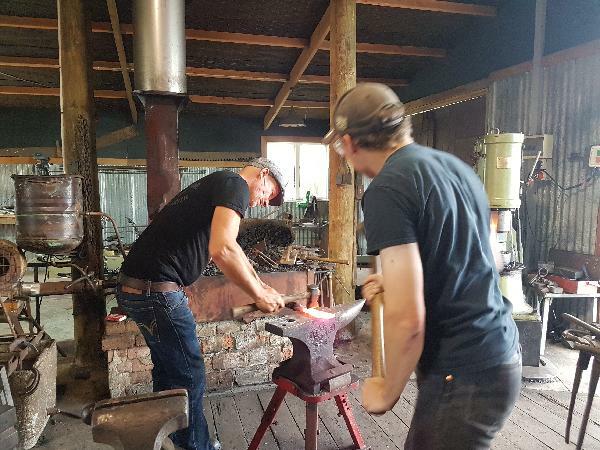 Situated in the beautiful central North Island, the blacksmith forge is set in perfect environment for inspiration and creativity! Suitable for beginners, you have the choice to choose what your would like to create over the course, and best of all - you get to take your own piece of art home with you! Your tutor, Rob, is one of the true time served Blacksmiths in New Zealand. Rob teaches with lots of enthusiasm and Kiwi humor, so you know you’ll have a great time! 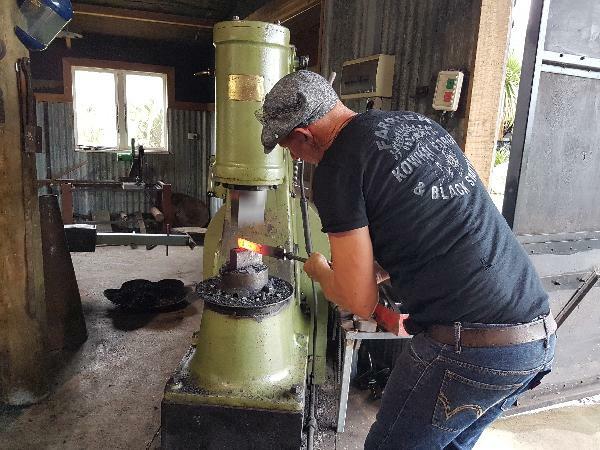 His passion, skill, and deep understanding this fascinating skill ensures you a truly authentic experience into the world of Blacksmithing in New Zealand. Fantastic year round - in the summer months the large forge doors are opened to let the sunshine in and in the winter months you will be cozy and warm inside by the coal fire. Half-day experience in the forge: The half-day course is great for those who would like to get a little taste of what blacksmithing is all about. You’ll be introduced to some of the basics and will have time for a small hand forged project. Here are some of the things you can choose from: a fire poker, coat hook, garden tool, herb/pizza knife, pizza oven tool, corkscrew or bottle opener. Full day experience in the forge: More time, better projects! A full day is great for knife making. Several styles are possible such as a hunting/camping or a chef’s knife. You will hand forge your knife from scratch (with a little help of course!) and will fit it with a wooden handle. A small axe is also possible to make during this workshop. Other fun projects are a door knocker, a bird feeder, flowers, gardening tools, BBQ tools or how about a set of tools for your fireplace or pizza oven? Do you have another idea? Let us know, we love trying new things! Heating the metal before working on it. great time to learn a bit about blacksmithing. even if you want to get into blacksmithing or not. its a great place to learn, great fun. There were a few different things that really come together to make this an awesome experience: First off, it’s blacksmithing - so right off the hop it’s pretty cool and unique. Secondly, Arja & Rob are lovely, down-to-earth people. This isn’t a big tourist trap churning people through the doors - it’s a family affair, and these guys are friendly and welcoming. Their personalities just amplify the experience. Lastly, Rob’s passion for blacksmithig just pours out of him the second he steps into the shop. It really is one of those magical things where you get to work with someone who is completely in the element of doing what they love. I think this was the best part of it. I booked a workshop for my partner and I as part of his birthday weekend surprise. Despite not knowing what to expect and probably one of the most unlikely characters to do a Blacksmithing course, Rob and his family have been very welcoming and accommodating. There was lots of learning, fun and laughter as Rob shared his passion with us. I highly recommend this to anyone who is looking to try something new and would like to experience the art of blacksmithing. The Kowhai Forge experience should not be missed. It was grass roots to the core. Certainly it invites each participant to immerse themselves in past history even so briefly. The forging of metal using fire and creativity, enabled me to appreciate my Maori heritage and culture. In a tactile manner it encouraged me to see the individual successes of Maori. Thus organically the process of forging and constant reshaping can bring about success. Our hosts Anja and Rob were inclusive to everyone's needs. The heart and soul of Kowhai Forge is Rob and Anja. Without them it would be just a another business. To those who maybe thinking of ... please find time to be part of a very special experience. A very interesting experience! I made a herb knife and it's so cool! Rob is a nice and patient person! Would definitely recommend to my friends! Thank you so much for taking the time to leave a review! It was great having you here! Your message has been sent to Blacksmithing Course - Kowhai Forge. You should hear from them shortly. Please note: all responses will come directly from Blacksmithing Course - Kowhai Forge, and not the team at Bookme.